I am a big fan of original art. I think that it really makes a room special, and is the most beautiful way to introduce color and pattern to a neutral space. I particularly gravitate towards traditional furnishings combined with contemporary art; the juxtaposition of the old and the new creates a wonderful synergy that gives a room a fresh, modern feel. Contemporary art also seems to notch down the formality of a room with traditional furnishings. Design by Brian McClure. This is a very neutral room with traditional furnishings. The artwork is what makes the room come alive. Interior design by Caldwell-Beebe. 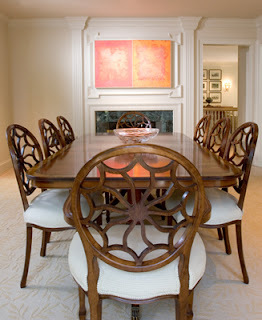 A traditional and neutral dining room gets a punch of color from a contemporary dyptich (two paintings created as a set). Artwork by Carolyn Carr, and Atlanta artist who is represented by the Fay Gold Gallery (picture via Brilliant Asylum) . The artwork is the big focal point of the room (I barely notice anything else!). 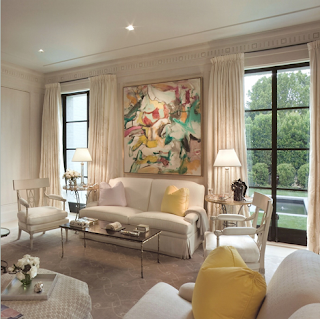 A beautiful room by Suzanne Kasler. Art purists usually look down on matching the art to the sofa or the decor. To them, this reduces art to decorative rather than artistic. I must admit that I do not feel that way at all. First and foremost, a piece of art should create an emotional response in you. Often, the art that you respond to has similarities to the decor that you respond to, in both color and form. 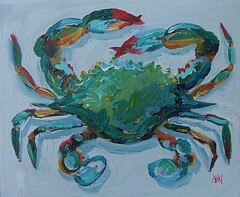 My favorite colors...muted greens, creams, blues, oranges...are the colors that I respond to in paintings. 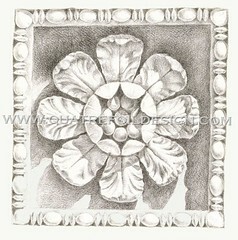 I also respond to flowing lines and circles, not hard forms such as squares. So the art that speaks to me tends to reflect what I gravitate to in decor. A beautiful scene from Decor8's blog. I love this picture because it looks like they started with the art, then chose the pillow and rug colors. Look how the pillows pick up all of the colors in the painting. This really appeals to the art and decor sides of me. If I were to start from scratch in a room, and had the luxury of time, I would use the art as the starting point. So, the decor would match the art instead of the other way around! A tableau from the Atlanta showroom Renfroe. 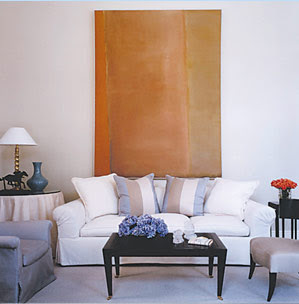 The art brings color to the neutral furnishings, and the pillows pick up the tones in the painting. Interior design by Caldwell-Beebe. I love how the chair reflects the colors of the painting. There are so many sources for original art, and the internet has given the art buyer even more options. Ebay has many wonderful artists, but there are so many paintings listed that it is sometimes difficult to find the really talented artists. Etsy is another source for reasonably priced original art. When purchasing art over the internet, particularly large pieces, keep in mind that it is sometimes hard to tell what a painting will look like in real life due to difference in monitor colors. I usually like to see a piece of art before I purchase. Galleries, of course, have top notch talent, and most galleries are happy to allow you to take a piece home on approval before purchasing. Many cities also have areas with a concentration of artists studios, and it is possible to purchase art directly from the artist. Another wonderful source for original art are the many art fairs and art markets that are going on virtually every weekend. Check your local paper or event magazine for art specific events. I really like the image with the Carr work and the last desk image. That last one really speaks to me. I really love original art too. Whether it is a painting or a sketch something about it being original makes it so much more appealing to me. I always buy art when I travel (which isn't nearly enough, but that is another story...). That way I have original art by artists who were sitting out on the street corner in every place I've been. That way I get art and memories all in one! Her art work is first class, but i don't think it's ultra expensive, anyway - it's a great guilty pleasure book with lots of great art work, I think you might like it. Artwork can really define a space. 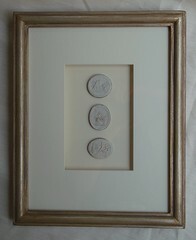 And given that wonderful, original artwork can be had at any price level it's nice to know that anyone can enjoy it. Etsy is favorite site of mine! I've purchased art from several places on line. Ebay is a good start, try searchign fro the daily painting folks, their works are smaller which usually means less expensive. Michelle uses the funds generated from the ebay sales to support her art school's scholarship fund. I love the painting in first picture--I could just look at it for hours. And I love how the second one is "framed"! 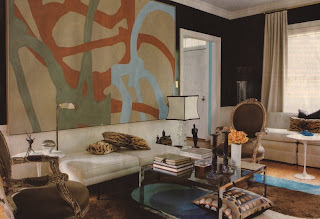 Wonderful post, and definitely my style of decorating. Thanks for the comments, everyone! This is a subject near and dear to my heart. Mongoose, those are some great painting resources! Great post! I think decoration in and of itself is just as much art as any other medium. An entire room is an "installation" or piece.I enjoy embracing both by painting interiors, but also love painting food and whatever else speaks to me. I, like you, am more drawn to fluid shapes than linear. There are just so many sources of inspiration.Sometimes the room itself is the inspiration for the art, and then sometimes the art inspires the room. You have shown some wonderful examples. You pulled great images here - they underscore your point perfectly. So many nice rooms I had not seen before. A total treat in my current Halloween madness. 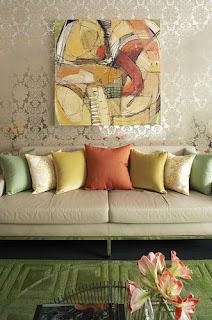 Great post, I love seeing original art in people's homes. 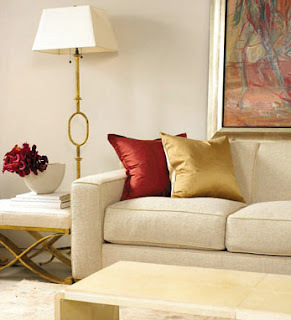 And I am really gravitating towards contemporary with a mix of modern and period furnishings, its such a great mix. Another great post. You always say so much in what you write, and educate at the same time. I agree with you completely about mixing modern/contemporary art into a more traditional room. I especially like using Miro prints because they are just so colourful and can be used in so many spaces. And, yes, art fairs are a terrific place to find original artwork! I love the Kasler (sp) photo...the simplicity...just stunning! Hi, why not try artists blogs and website? Regia create colorful modern paintings. 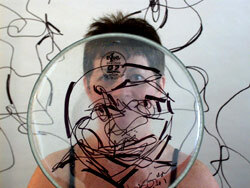 or try the Saatchi gallery online new Saleroom. Nice collection of photos! I totally agree with the combination of old and new. It gives a spce life and a story. Carr's work is so clean and fluid. 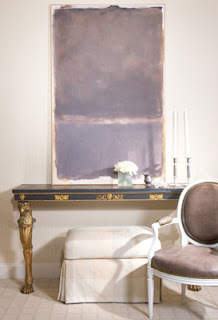 I love how it balances out the mix of contemporary and antique pieces in this room.